The SkyRC MC6 charger is designed to be connected to a 5V / 2.1 A USB port. It features 6 charge outputs and may be used to check the battery voltage. The LED display indicates the output number and the battery voltage, and a LED near each output is red during charging, and green when charge is complete. Four outputs deliver 350 mA and two outputs deliver 500 mA. 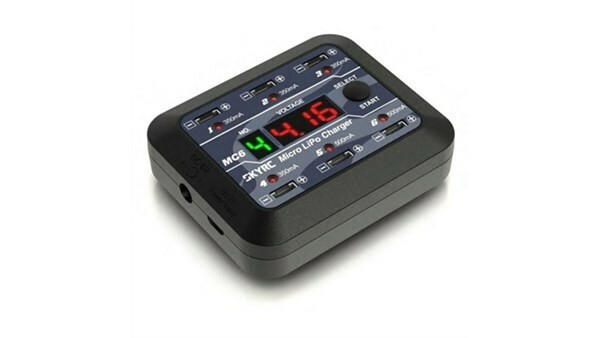 SKYRC MC6 Micro LiPo Charger features 6 charge outputs and may be used to check the battery voltage.